The Swedish Chamber of Commerce in the Netherlands organized a photo contest on Instagram. Their Junior Chamber Club has 2 tickets for Roxette’s Amsterdam concert (27th May) to give away. The contest seems to be open for anyone in the world, so you don’t necessarily have to be a Dutch citizen to enter. 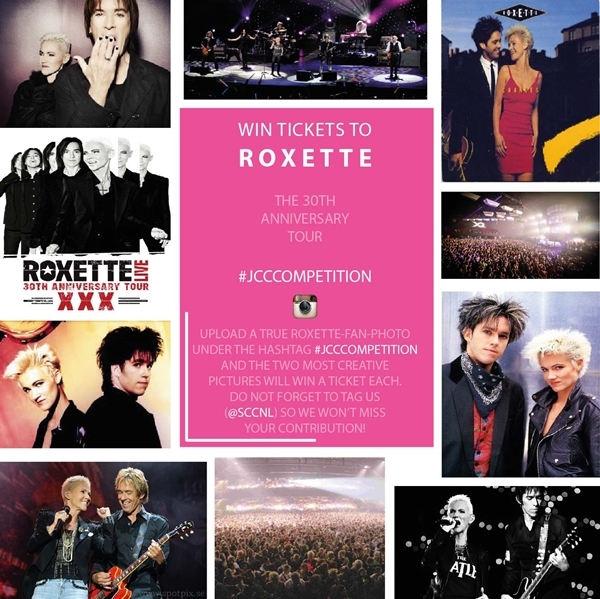 All you have to do is to follow @sccnl on Instagram and upload a true Roxette-fan-picture with the hashtag #JCCcompetition before 1st May. The 2 most creative pictures will be picked and their owners will win a ticket each. Do not forget to tag @sccnl, so they won’t miss your contribution! Amsterdam was a magical place in 2009 (IMHBL; TL) and Roxette definitely did magic there in 2012, too (Silver Blue; HDYD / Dangerous). Wanna see how the 2015 Amsterdam gig will be? Enter the contest! Good luck! In case you don’t win, you can still buy your ticket for the show HERE. Yesterday the Dutch TV station broadcasted a 50-minutes special on “Night of the Proms 2009” tour. Two Roxette songs were included – “The look” & “Joyride”. If you want to watch the programme, click here – you have to look after “bekijk uitzending” button. Anyone who can download it and upload it somewhere? The high quality versions would be highly appreciated! It was recorded in Rotterdam on November 21st. Thanks to Roxette Holland at TDR for information.